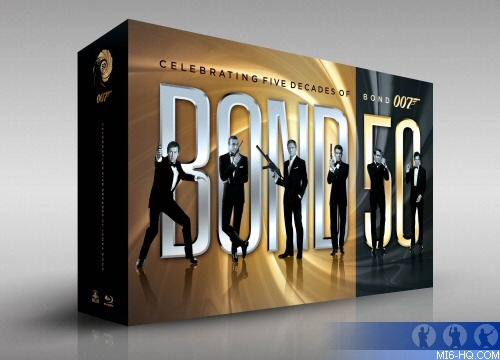 In celebration of James Bond's monumental golden anniversary, Metro-Goldwyn-Mayer Studios and Twentieth Century Fox Home Entertainment today unveiled BOND 50, a collectible box-set featuring all 22 James Bond films on Blu-ray Disc for the first time in one complete offering. The longest running film franchise of all time, the Bond 50 collection marks the debut of nine James Bond films previously unavailable in high definition Blu-ray. Fans around the world can pre-order now with participating online retailers. "We have a whole program of exciting activities planned for our 50th anniversary year, beginning with today's announcement, by Fox, of the release of all 22 films on Blu-ray for the very first time," added Michael G. Wilson and Barbara Broccoli, with EON Productions. "We are also delighted that Fox has unveiled a specially designed anniversary poster which we hope the fans will love as much as we do. Our website, 007.com will be regularly updated with all the latest anniversary news and events." NEW – The World of Bond – the 007 films have a look, style and attitude that is signature Bond. From the cars, to the women, to the villains and even the music, Bond films stand apart. The World of Bond takes the viewer through the best of five decades worth of classic James Bond in one thrilling montage. The World of Bond showcases the fascinating and entertaining interplay among unforgettable moments of danger, seduction, adventure and a dash of that distinguished humor that fans have cherished from the beginning up until now.To add to the experience, The World of Bond featurette will also offer a Pop-Up Trivia option to challenge even the sharpest of fans with little known facts and interesting trivia from the Bond Universe. MI6 Note: The above 'special features' are not final and not exhuastive. Further details will be released at a later date.